Just as The Flash returned last week, this week Arrow comes back to the CW following the Christmas break. When last we left the solo series, Oliver was officially made a deputy member of the Star City Police Department so that he may operate as the Green Arrow while still within the boundaries of the law. This added more to his already quickly growing plate of tasks and worries, as he also recently learned of Felicity’s propensity and willingness to resort to darker measures to get the job done during his tenure in Slabside Prison. Add to that having a new Green Arrow to contend with (whom we now know to be Emiko Queen), and Oliver already has a full-course meal of problems; I wonder if he misses those Slabside buffets yet. Mystery is the name of the game for Oliver and Company in “My Name is Emiko Queen,” as Oliver’s first crime scene as part of official law enforcement personnel turns up a blood sample of the new Green Arrow – the first real lead anyone has had on the hooded heroine. Meanwhile, Diggle and Layla must convince an ARGUS-held Ricardo Diaz to give them information on a “Dante” who fronted Diaz’s bill to the Longbow Hunters. Elsewhere, Rene tries getting the new Green Arrow to allow him to help her clean up the Glades and learns the purpose behind her fight. 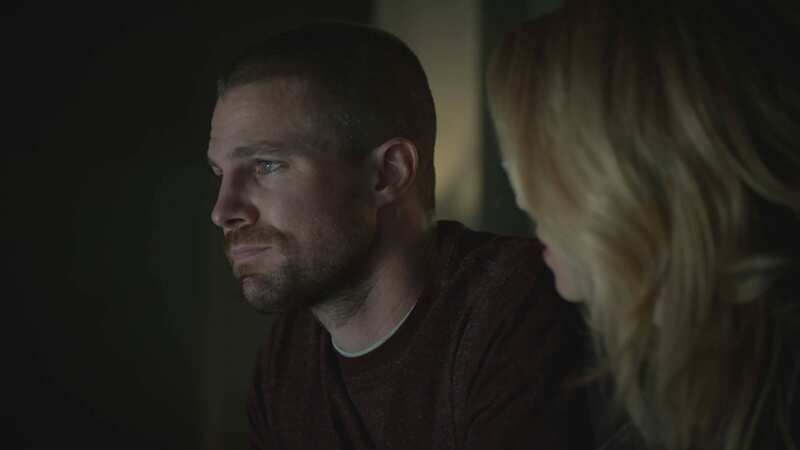 During their time researching into anything they can find about Emiko, Oliver and Felicity are in two very disparate frames of mind. Oliver is still decidedly uncomfortable with his wife’s transformation into the “whatever gets the job done” sort, but Felicity shows clear sympathy for her husband in the revelation that his father not only had another woman and daughter but also abandoned them. Stephen Amell shows great emotional range when he isn’t kneecapped by the script, and “My Name is Emiko Queen” gives him that opportunity. In fact, his scenes with Felicity, when there are visibly two battles going on inside his head and heart while his wife tries to console and encourage him, are some of the best so far this season and are a far stone’s throw from your standard CW emotional scenes. That said, they never actually touch on their marital issues in this episode, and while that may be a decision made so that the focus was left on Oliver’s newfound disappointment with Robert’s choices, I do hope that Oliver and Felicity can go a season without being in a fight of some sort or another. (I know, I know, this is the CW we’re talking about, so I won’t hold my breath.) It should be interesting to see how next week will play out, with Oliver meeting Emiko for the first time over their father’s grave, as Emiko already seems to be predisposed to not thinking too highly of the Queen family. The flash forwards return in “My Name is Emiko Queen,” with no further insight into just what exactly is going on or what had transpired to bring events to where they are now (then? Time skips, man…). Something that I noticed that is jarring from jump street is that the grayish-blue filter that had been used up until now during these future scenes is no longer present. At first, I was completely thrown off by that sudden change in the characters’ appearances and placement, but I later realized what was going on. I’m still largely uninterested in these scenes because they feel directionless and like the writers are just making things up as they go. They’re going to have to do something interesting – and fast – to make the future storyline worthwhile, but with us nearing the halfway point of the season, my hopes aren’t too high. By the way, nice comb over, Rene. The story being told through the Oliver and Felicity, and Rene and Emiko scenes kept me interested and engaged throughout “My Name is Emiko Queen.” I am legitimately curious to see where the writers are taking the plot, especially given the… creative liberties that they’re taking with Emiko Queen’s comic book origin right from the start. Something I did find very noteworthy was the reference back to the series’ premiere season and Moria Queen discovering that her husband had hidden something from all of them. Flash-forward to the present and Oliver learning about Emiko, and we are beginning to see some older threads from the series connected to the new plots, for which I applaud the showrunners. Now they just need to have this season of Arrow make some sense because as of right now, it feels as though it is going in sixteen different directions at once. Arrow - Season 7 Episode 10 "My Name is Emiko Queen"
A return to CW drama holds this episode back from being great; however, more revelations about Emiko Queen and the mystery surrounding her character keep things interesting throughout.